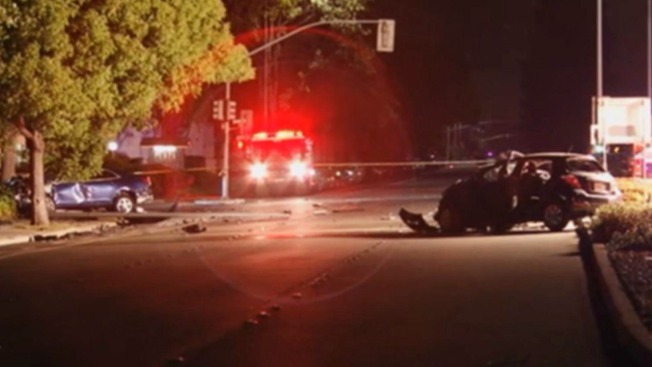 A teenager on her way home from prom night was killed, and her mother suffered major injuries during a grisly crash in Fremont early Sunday morning, police said. A Toyota Yaris was attempting to make a left turn from Fremont Boulevard onto Darwin Drive around 2:30 a.m. when a Chevy Malibu traveling in the opposite direction of Fremont Boulevard collided with the Yaris, according to Fremont police. An 18-year-old woman riding in the front passenger seat of the Yaris was pronounced dead at the scene, according to police. Later Sunday, she was identified as Fremont resident Shane Alexis Marcelino. Marcelino was a senior at James Logan High School in Union City, according to the campus newspaper The Courier. She was on her way back home from senior prom night, the newspaper said. Her close friends called her Shaney. Some went to the accident scene Sunday night, still stunned. David Willkom knew Shaney from youth ministry at Saint Anne's Catholic Church. "I wanted to pray and talk to her," Willkom said. "I want her to be remembered as a person who was always willing to help someone, no matter what." Friends say Marcelino was a talented flutist who was in the school band. Marcelino's mother, 39, suffered major non-life-threatening injuries and was rushed to a nearby hospital. A 23-year-old man from Union City was behind the wheel of the Malibu and a 25-year-old man was in the front passenger seat, police said. Both suffered minor injuries and were transported to nearby hospitals. A complete investigation has yet to be conducted, but speeding and running a red light may have played a role in the crash, according to Fremont Fire Department Battalion Chief Richard Dickinson. "It looks like they were traveling at a pretty good rate of speed," he said. "(The cars) are definitely separated. It was a heavy impact. Major damage." No arrests were made Sunday, police said. Michael Whalen lives near the accident scene and saw the mangled car. "This is a terrible intersection," he said. "I see accidents here multiple times a year, and I often see cars getting T-boned." Traffic in the area was impacted for several hours while crews investigated the crash. Editor's Note: A previous edition of this report stated that two people sustained critical injuries, according to fire officials. A subsequent investigation revealed that only one person sustained critical injuries, according to police.